Today, at the end of the year, 3.853 items are exhibited in the gallery!!! Many Thanks!!! Heute, zum Ende des Jahres, sind 3853 Belege in der Galerie ausgestellt!!! Vielen Dank!!! 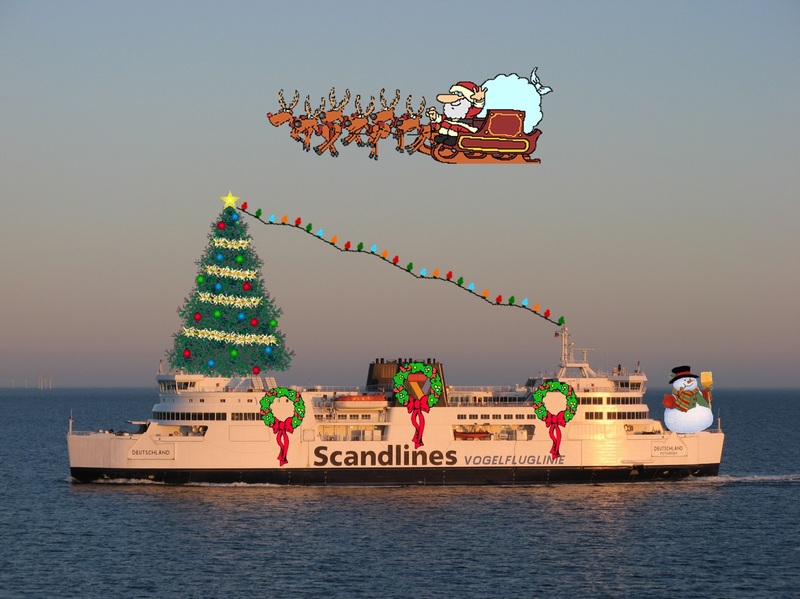 I wish a Merry X-mas and a Happy New Year to all visitors, guests, supporters and friends of “Paquebot.info”!!! Ich wünsche allen Besuchern, Gästen, Unterstützern und Freunden von “Paquebot.info” eine Frohe Weihnacht und ein glückliches Neues Jahr!!! Roger M. Hosking, the great mentor of the Paquebot collectors community of the last decades passed away at the high age of 88 years on 9th december. He was not only known across the world as the author of three editions of his catalogue “Paquebot Cancellations of the World”, an essential reference book for every ship mail collector. It is a grievous loss for philatelists around the world. We will honor his memory! Roger M. Hosking, der weltweit führende Experte auf dem Gebiet der Paquebotabstempelungen, ist am 9. Dezember, im Alter von 88 Jahren, auf letzte große Reise gegangen. Besonders durch die drei Auflagen des, von ihm erstellten, Katalog “Paquebot Cancellations of the World” hat er sich in Philatelistenkreisen einen großen Namen gemacht. Sein Tod ist ein sehr schmerzlicher Verlust für die Philatelie! Dirk Stratmann and Mike Dovey exhibited an unlisted mark of St Peter Port (Guernsey) in the gallery. Dirk Stratmann und Mike Dovey haben einen noch nicht katalogisierten Paquebotstempel von St. Peter Port (Guernsey) in der Galerie ausgestellt. my covers of Sydney 1509 are stamped at “GPO” or “Philatelic Sales Centre”, which may be the same. suggestion is: 2 different offices, 2 different marks. I have added the Sydney paquebot mark to the addenda with a remark that it “needs checking”. My own view is that it does need checking as there was a mark (1509) for Sydney at the time and so I don’t understand why this new mark comes into view, however by putting it into the public domain we may find an answer. An unknown Paquebot mark of (probably) Sydney appeared on scene on two items. The mark is 36,6 mm long and 8 mm high. The two covers are shown in the gallery. Ein unbekannter Stempel, der wahrscheinlich Sydney zuzuordnen ist, ist jetzt in der Galerie auf zwei Belegen zu sehen. Der Stempel ist 36,5 mm lang und 8 mm hoch. D.Stratmann exhibited an unknown cancellation of Matosinhos (Portugal) in the gallery! Herr Stratmann hat in der Galerie einen noch unbekannten Stempel von Matosinhos (Porugal) ausgestellt! Who knows this PAQUEBOT mark? 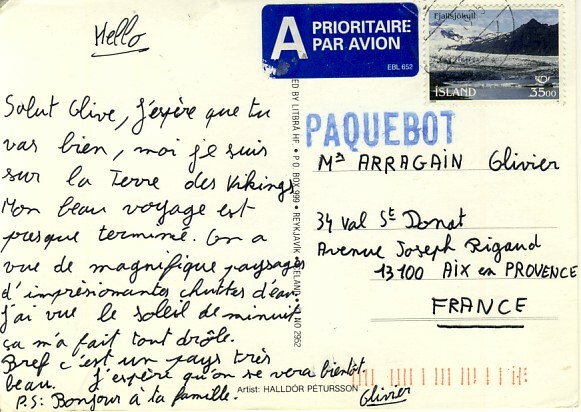 The Island stamp is cancelled by “SEYDISFJORDUR 4.8.1995″ and word PAQUEBOT is 37 mm long and 8 mm high. Who can help with additional informations or other cards/covers marked by this cancellation? Lee Chang Sung did work for a Korean shipping company and he did post covers from a numbers of ships in the 1980′s – fact. He used these posting sheets for all of his postings in order to obtain a paquebot mark and where the post office held a paquebot mark this mark was added the the covers and sent onwards in the normal way – fact. However if he walked into a PO that did not have a current paquebot mark he produced one he had made already himself and presented it to the PO to be used on the covers – fact. What is not certain is what happened after such an event. 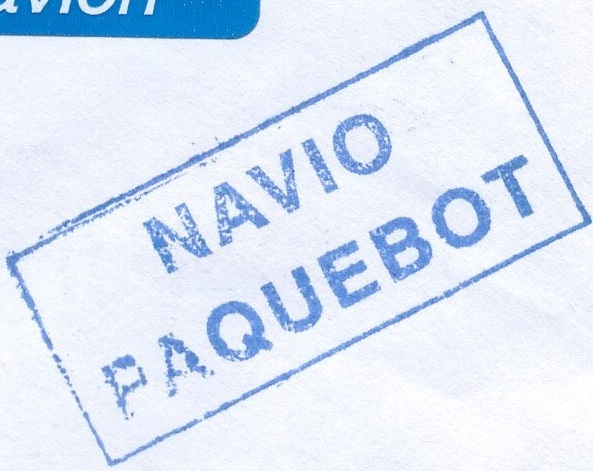 It could be that he left the new paquebot mark with the PO and it was used again or – more likely – he then walked out of the PO taking the said paquebot mark with him (which would explain how some ports have the same mark although they are in different countries. It is true to say that where Sung used such a mark it was only ever used the one time and never seen again (Chimbote and Iquique being but 2 of many) and in all the ports where the mark was used again it is usually always on a Sung ship when he called at the port maybe a year later. When I updated the book I studied around 80 covers posted by Lee Chang Sung in my own collection and came to the conclusion that while he did post covers in good faith at some ports which did have a paquebot mark already he did contrive other marks with rubber stamps of his own making, hence the U classification. The moment I placed a money value on the A -H listings for rarity etc I knew that I could not place a money value on contrived covers and so I made them a U class. However it is always up to each collector to decide whether I am right or wrong and it is for you to decide whether I am indeed right or wrong. I would willingly take off the U class and give certain ports anything up to a D class if there was a second posting from a ship that was not a “Sung” ship but until anything like that happens then I have to protect the integrity of collectors and make them aware that many of the Sung covers are not what they seem. I am always open to discussion on this topic and Sung is certainly not the first to contrive marks but to maybe make a Iquique cover a D class or rarer as there are only 43 known covers (as per the posting list) and allow collectors to pay very good money for something that is not what it seems would give creedence to what really is no more than a fake as it fails on all counts by UPU rules etc and so given a choice of making Iquique a D in the book and giving Sung the satisfaction of creating a value or just unclassifying it as a U then I have to go for the latter as I would be lying if I did anything else. When you have studied as many Lee Chang Sung covers as I have then you would, I am sure, reach the same conclusion as myself. He actually wrote a book on Korean paquebot marks and left out some of his own marks which says something for the man – I know as I had a copy when I did the paquebot book. Many thanks as always for your time and endeavours with the study of paquebot marks, as I say I am always open to discussion and I am always aware that not everyone will agree with me, however my thoughts are that I cannot give a money value to something that is not what it seems and if I did then I would not be being fair to any readers of the book. The hobby would be so much better if people like Sung had stuck to the fact that many ports will never have a paquebot mark and if we did not have these silly marks then our hobby could well be more respected by others, alas he brings the whole subject into disrepute by what is basically cheating.